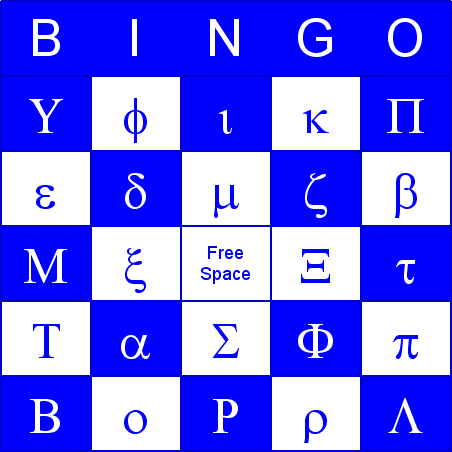 Greek alphabet Bingo is a fun way to learn the Greek alphabet. You play just like a normal bingo game, except the items and cards all have a Greek alphabet theme. In this example, Greek alphabet bingo, we have created bingo cards that can contain any upper or lower case letter of the Greek alphabet. (On other pages, we have also created separate sets of bingo cards with either just the lower case Greek alphabet, or just the upper case Greek alphabet). If you'd like to create your own bingo cards, but with your own customized list of items on any topic that you like, you can do so easily, by using the Bingo Card Printer software. The software (after you have Registered to get the full version) allows you to add your own items or delete any items that you don't want. Below is a printable set of greek alphabet bingo cards (click the Print icon in the window to print) along with a call-list. Just print and play! Instructions for producing your own custom greek alphabet bingo cards are below.